Integrante de la lista del Registro Nacional de Lugares Históricos, el hotel Fairmont Olympic es uno de los tesoros más ilustres, y lujosos de la ciudad. 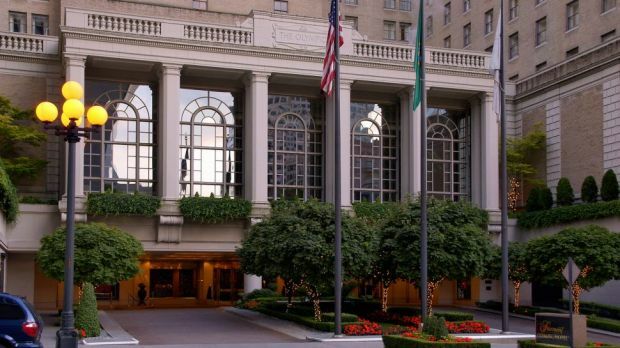 Enviar una solicitud de disponibilidad con las fechas que desee a Fairmont Olympic Hotel. Room with 1 King bed and a view of the courtyard. Non-smoking room. Room with 1 King bed and a sitting area with a desk. Non-smoking room. Featuring a Double bed, elegant decor, marble bathroom, flat-screen TV, WiFi internet, pillow top mattress, and luxury linens. Features a king bed, local artworks, located on the top floor, marble bathroom. Features a King bed, WiFi Internet, marble bathroom, Le Labo amenities, flat-screen TV, pillow top mattress and luxury linens. Features two double beds, local artworks, located on the top floors, luxury bedding and a marble bathroom. Features a king bed, local artwork, city views, marble bathroom. Features a king bed, partial water views, located on the top floor with local artworks. Features a king bed, partial water views, local artwork and a marble bathroom. Suite with 1 King bed and a spacious parlor. Non-smoking suite. Suite with 1 King bed and a sitting area with a sofa bed. Non-smoking suite. Features a king bed, local artworks, separate living space, marble bathroom. Room with 1 King bed and a sitting area with a desk. Smoking room. Features a partial water view, located on the top floors, marble bathroom. Located on the top floors with local artwork, Nespresso coffee maker. Features a king bed, marble bathroom, flat screen TV, living room, Le Labo amenities. Features a king bed, local artwork, city views, two flat screen TVs, Murphy bed in parlor area.